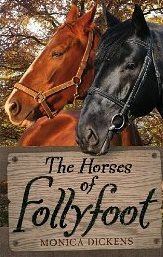 Rosemary Anne Sisson, who wrote two episodes of Follyfoot - Debt of Honour and The Hundred Pound Horse - with wry humour, passed away in July 2017, aged 93. The author Rosemary Anne Sisson was best known as the lead writer on the 1970s television series Upstairs Downstairs. A daughter of Shakespearian scholar CJ Sisson, she was educated at Cheltenham Ladies’ College before going on to read English at University College London, her studies interrupted by two wartime years spotting aircraft for the Royal Air Force over the English Channel. At the end of the war she felt “defeated and hungry” and escaped to the US, where she taught English literature to recently demobbed GIs. On returning, she took her master’s at Cambridge and taught at UCL and the University of Birmingham before securing a life-changing job as drama critic of the Stratford Herald. Enchanted by seeing Richard Burton playing Prince Hal, she wrote a blank-verse sequel, The Queen and the Welshman, which imagined what happened when Henry V’s widow fell in love with Owen Tudor. Starring Edward Woodward and Frank Finlay, it opened in Edinburgh and moved to the Lyric, Hammersmith (1957). Although her theatre career didn’t develop as she had hoped, the play provided the bridge to her screen successes. When it was adapted for TV by John Wiles, Sisson sat beside him and, with characteristic agility, learned the essence of the craft in a few weeks. During the next two decades she wrote countless scripts, including The Irish RM, The Six Wives of Henry VIII, The Duchess of Duke Street and The Manions of America. In Hollywood, she worked on four Disney films and George Lucas’ television series The Young Indiana Jones Chronicles. She also wrote children’s books, novels, poems and contributions to royal tournaments and son et lumiere events. Sisson co-chaired the Writers’ Guild with Bruce Stewart between 1978 and 1980, and was president from 1995 to 1999. In 1974, she became the first female full member of the Dramatists’ Club, writing a sparkling history of the organisation on its 100th anniversary in 2009. Known to close friends as Romy, in person she was unfailingly effusive and polite. The charming surface belied the complex character beneath: the theatre lover whose successes came on screen, not stage; the Conservative who was an active trades unionist; the passionate woman who, aged 30, made the decision never to marry or have children because she felt “settled and at home with herself”. Rosemary Anne Sisson was born on October 13, 1923 and died on July 28, aged 93. Welcome to the fan fiction section of the website where you will find original stories by members of the forum.